(Williams, Frank �editor). Mental Hygiene Bulletin. 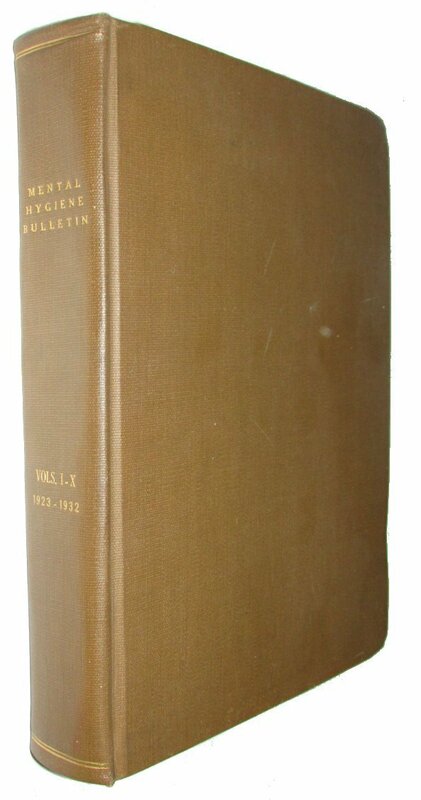 New York: Published by the Committee for Mental Hygiene, January, 1923-December 1932. Vol. 1, No.1 through Vol. X Nos. 9 and 10 (all published.) 4to., issues bound in plain brown cloth, the pagination varies with the shortest bulletins (usually early) being 2pp. and the longest 20 pp., with the average length 8 - 12pp. 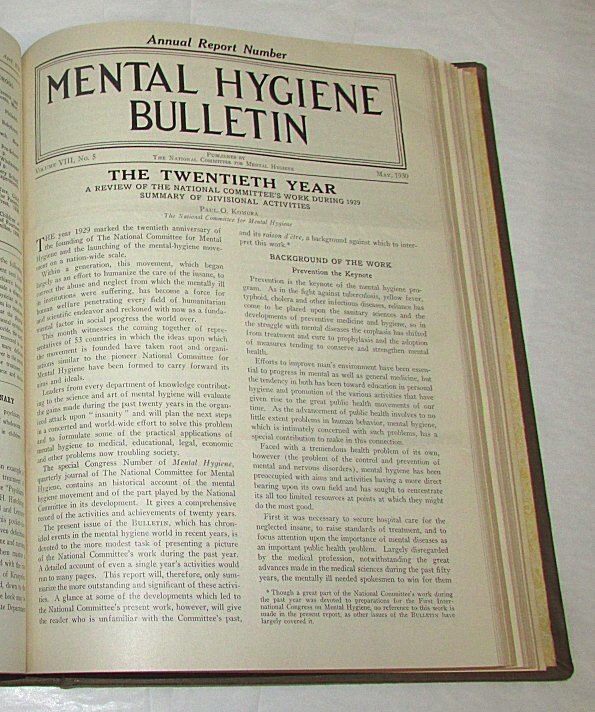 The Mental Hygiene Bulletin began as an offshoot of the publication Mental Hygiene when it became apparent that there was a �need for a more frequent publication through which those interested in various aspects of mental hygiene could be kept informed of events as they take place' (Vol.1, No. 1 p.1). 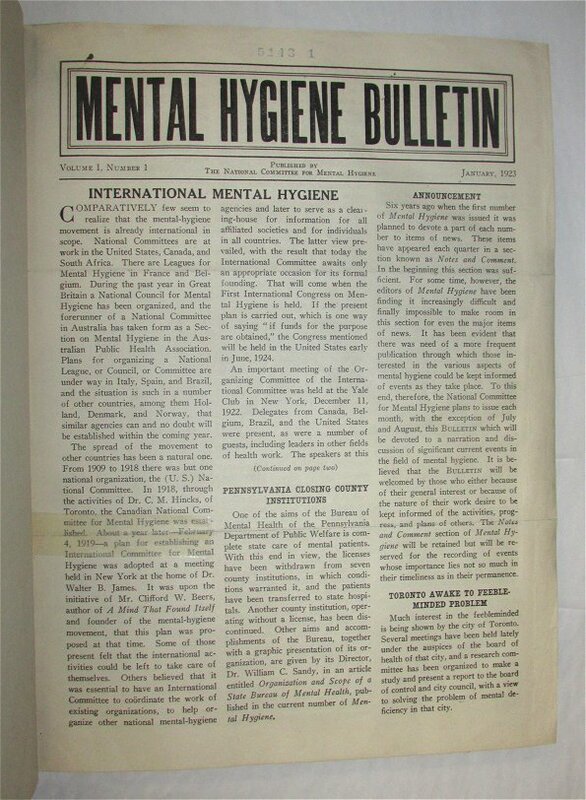 �Devoted to a narration and discussion of significant current events in mental health' the bulletin was issued monthly (except for July and August) by the National Committee for Hygiene. The first eight volumes (1923 through the end of 1930) were edited by Frankwood Williams, an American psychiatrist who worked with the National Committee for Mental Hygiene from 1916 to 1931, serving as medical director from 1923-193). Through an advocacy for the science of psychiatry as a prevention of mental illness, Williams hope to reduce the number of cases of mental illness reported. He focused on social issues such as alcoholism and criminality; taking part in a survey of prisons in the county of New York which showed that �a significant percentage of individuals confined in them suffered from mental illness.' (Am Journal of Public Health, April 2007). Williams worked for the development of clinics for the treatment of juvenile delinquents and to prevent these problems, intervention strategies that targeted early childhood. 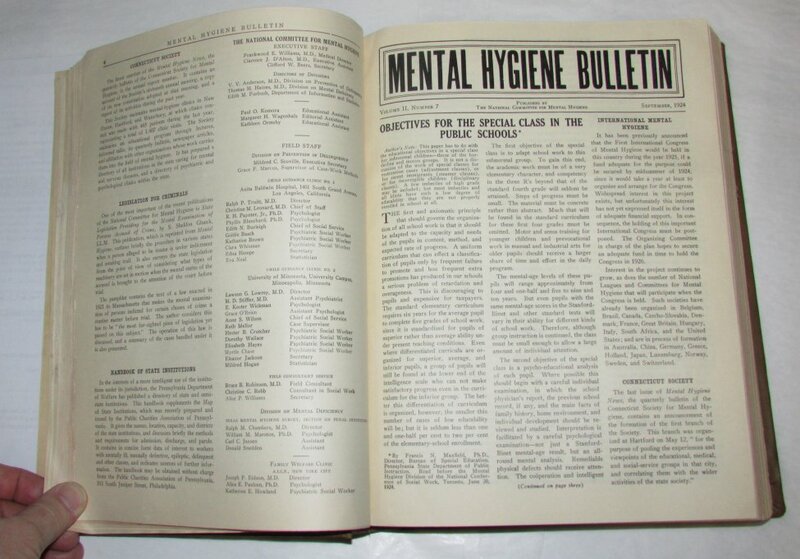 In addition to editing the �bulletin', Williams major publication was Finding a Way in Mental Hygiene. The last two volumes were edited by Paul Komora, who worked with the Committee from 1914 to 1944. 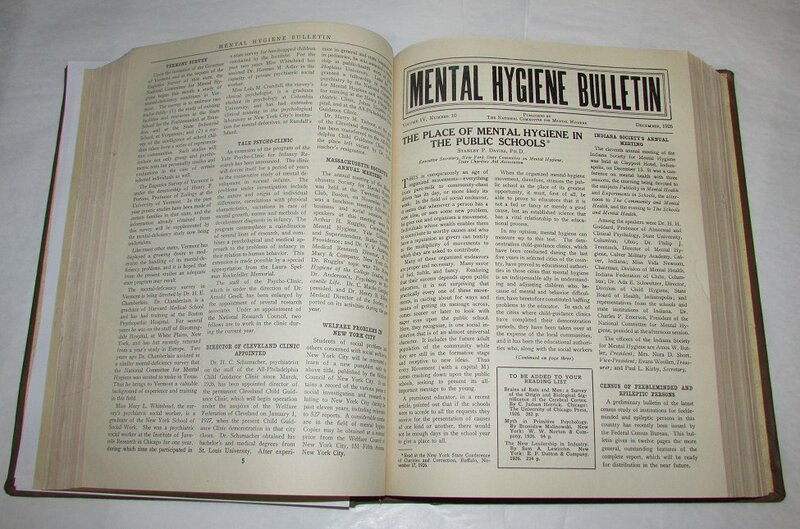 The content reflects the work of the National Committee for Hygiene and those associated with it including Williams, Clarence Hincks, and William Welch, as well as other psychiatrists, doctors, sociologists and social workers with an interest in mental hygiene, especially as it relates to juvenile delinquency and criminality. There are short subject based articles, as well as �bulletin' style reports, information on conferences and recent publications.